Virgin Voyages unveiled renderings in New York today of many of the public spaces on their first cruise ship, which is currently under construction in Genoa, Italy and scheduled to debut in 2020. The spaces, which have been designed for an 18-and-over crowd, have taken a full year of design and a full year of engineering to develop. The line intentionally chose to work with designers and architects who have never worked on ships before, but instead have spent their careers creating nightclubs, hotels, restaurants, and even movie sets. “We have designed the experience for people who never would have considered cruising because they didn’t think it was cool,” says Stacy Shaw, Vice President of Sales and Business Development for Virgin Voyages. And cool it is: The look and feel was inspired by the “Modern Romance of Sailing,” with a nod to the glamorous golden age of cruising, and a retro futuristic look that feels in line with Virgin Group’s other brands. The ship has been designed as a study of contrasts, with areas that are subdued abutting those that are over the top. The Manor, which will be a nightclub, was designed with an “emerald and aubergine” palette by the Roman and Williams design firm, which is best known for their work on chic New York City hotels, including The Ace Hotel, The Standard High Line, The Viceroy, and The Royalton. The same team designed The Dock, an outdoor space on Deck 7 that was inspired by lounges in The Hamptons, Ibiza, and Bali. With white daybeds on dark wood platforms and navy umbrellas, all facing the sea, it has a calming, clean, and nautical feel. The top deck renderings, which includes a private V.I.P lounge called Richard’s Rooftop, show a white-on-white palette with white rattan egg chairs, white pod-style seating, and white sectional couches as well as white Balinese-style daybeds topped with white umbrellas. Images of the test kitchen concept, which is being described as a restaurant, cooking school, and laboratory, are equally elegant and modern, with white tables and chairs and pops of green throughout. Pink Agave, an upscale Mexican restaurant, appears modern and chic, with a bar with pink velvet barstools as well as pink velvet banquettes in the restaurant itself and blue lighting. A motif of circles—primarily in divider cut outs, but also in the shapes of the two-top tables and in ceiling patterns, seem reminiscent of portholes. The Athletic Club concept combines a gym with a sports bar, called The Trophy Bar, with a sunbathing deck that has what the line is claiming is the largest day bed at sea overlooking the jogging track. Designers estimate it can hold up to 80 people. This space, with plenty of red trim and purple chairs, feels the most aligned with designs you might see in Virgin’s other brands. Shaw says that they don’t see their target audience as having a specific age or demographic, but more an outlook on life and a mindset of being young at heart. 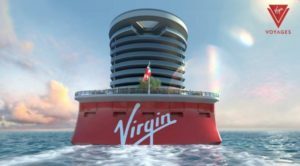 Virgin Voyages has three ships on order that are due for delivery in 2020, 2021, and 2022. The first ship, which is adults-only and will sail out of Miami, is expected to go on sale at the end of the year.